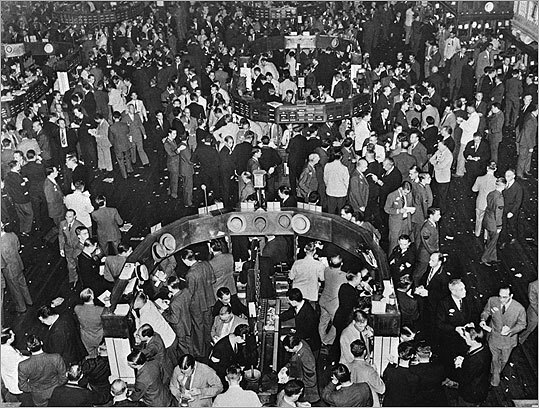 It was 80 years ago - Oct. 29, 1929, also known as "Black Tuesday," stunned Wall Street, and left investors scrambling for their funds. It was followed by the Great Depression of the 1930s. High volumes of selling and trading began the previous Thursday, Oct. 24. The Dow plummeted substantially, closing at 230 on Oct. 29. Marking this anniversary, we look at scenes from that week and the aftermath of the stock market crash. This photo shows traders working in Wall Street in New York City.